Foreign Talent Clean-up in Birmingham. Unlike previous English Opens, the domestic players were brushed aside leaving a crop of trophies going home to players outside of the UK. For perhaps the first time ever, in Men's Class A and Men's Class B the number one and two seeds reached the final, however it was Paul Twisterling (seeded two) who upset the symmetry by defeating number one seed Phil Reid. Reid, himself a badminton specialist, could not overcome the power of the Dutch exhibitionist. It was also no surprise to see German pairing Alex Koepf & Oli Zwiers push their way all the way to the final to face the clever pairing of Kerins/Foulds. Foulds, interestingly, lower ranked than Darren with squash as his best sport and therefore playing the 2nd half of the doubles match. However, Foulds was blown away by a certain Steffan Morgan (more about him later). But got enough to ensure Foulds/Kerins met German Pair Zwiers/Koepf in a closely fought final. The doubles had many good pairs and one of the most improved players in the doubles was Steve Thomson. Steve really showed great ability in all 4 sports and should he face in the future a weaker opponent than John ODonnell, Thomson will trouble many a racketlon player! 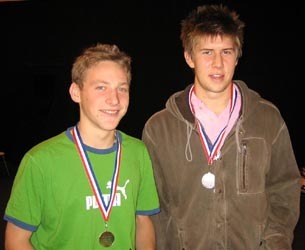 Postlethwaite & Isherwood had some great wins beating both Hogg/Hogg (brothers) and Whitehouse/Whitehouse (father & son), however what was most impressive was their unbeaten badminton record in the tournament, with squash being the weak link, but not that weak! Certainly these two individuals will make an impact in the future. Isherwood only lost to Twisterling in the Class B quarter finals but perhaps that can be excused, as, as a pair they didn't lose! Scratch entrants Paul Twisterling & Onno Quik upset Dan Carpenter & James Greenhead who ended up taking gold in the Mens Doubles class B event, beating Andrew and Alistair Hogg in the final. Gummi Nightmare Haunts Jordan for the 6th time! The exhibition was moved from Thursday evening to Friday evening and the line-up was strengthened accordingly and tweaked due to injuries for Richard Whitehouse and Oliver Zwiers. Rickard Persson, also unfortunately, had to pull out with illness. Calum Reid (Sco) took on Keith Lesser (Eng) in the initial table tennis and the Scot did well! Showing good touch and retrieving skills, Lesser was on the ropes! Lobs and curling loops had the crowd in awe and Lesser eventually took the set 21-18, with Reid missing his service at 18-20. Kerins dominated Twisterling and perhaps proved himself as the best badminton player in the tournament. Smashing and working the Dutchman (eventual class B winner) until the tank was near empty. Twisterling and all the Dutch crowd really added value to the event with their vocal support and made a good spectacle, great! County squash player Steffan Morgan really hasnt been challenged yet within the racketlon scene in his favoured discipline. Such results as John ODonnell 21-11 or Alex Koepf 21-3 show the strength of Englands new racketlon hope. Marc Veldkamp (ex-Dutch Squash Number Four) gave him a kicking! Well he was anyway at 15-7, the young Englishman then showed some character taking the ball earlier and moving more quickly really starting to wear down the charismatic veteran. Veldkamp really entertaining the crowd mimmicking a wheel chair movement and also a walking stick! Morgan was no different thrusting his head onto Veldkamp's bosom unwilling to continue until a stroke was awarded. Dutch Open organiser Veldkamp really belts it hard and low, but was not able to penetrate Morgans wall of defensive and counter-attacking weapons, succumbing in the end 22-20. Both players received a special award at the tournament presentations for this momentous effort! Marc Veldkamp, the organiser of the upcoming inaugural Dutch Open. Alan Cornish won the O65s, Dave Sutlieff won the O55s which had a good entry. Lorna See took the plaudits in Ladies O45s and Alistair Hogg defeated James Whelen before the tennis in the first ever junior event. The juniors is where racketlon needs to really get going and once it does watch the sport move to the next level. Hogg has certainly been practicing and is one talented young man for the future. 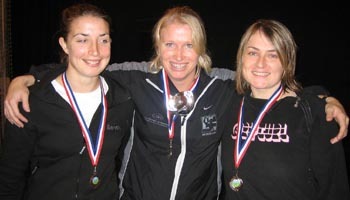 Not only did Alanna James win the mixed doubles with Steff Morgan, she also blew the field away in the Ladies Class B, it is always hard to tell with the first event, but Alanna certainly joins the likes of Natalie Lawrence, Kirstie Leach and Sarah Reeves as perhaps the top 4 English Ladies. Places in next years World Championship Team Event will be competitive indeed. Can James displace Lawrence at the top of the tree? There are many English talents that want that English Number Three Position behind the defiant Struthers & ODonnell and that battle may even be the most fiercely contested of any accolade in the next year or so. Noone can deny that the emergence of Dan Carpenter, Steffan Morgan and James Ashton puts the likes of Mark Jackson and Darren Kerins under a great deal of pressure. Men's O45s looks different, what happened there then? 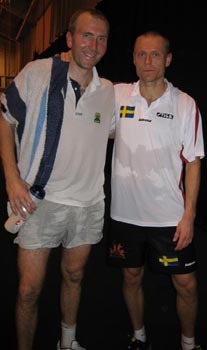 It cannot be denied that with Richard Whitehouse never losing to Dave Greatorex or Graham Norton in a competitive racketlon match he was the big favourite to take his 3rd English Open title (defeating Norton in both 2004 & 2005). Not many would have predicted that all three highly ranked Englishman would fall in or before the semi-final stage and not without some hard matches before that. Greatorex did well tell to overcome Selwyn Walmsley, after losing the table tennis and squash 21-7 and 21-13 respectively. Supreme badminton and tennis performances brought the number one seed into the semi-finals. Richard Whitehouse was pushed by Ged Doherty all the way also in the quarters and only won through at 16-8, very close indeed! Ray Simpson continued his impressive run from the Scottish Open, defeating both Graham Norton and then Richard Whitehouse to take him to his 2nd consecutive final. This performance earned him player of the tournament. Simpson (by his own admission) has shaky tennis, but try getting him there. Not many can, thats for sure and certainly the strongest badminton player in the O45s. Where Simpson failed, De Vries conquered. The Portuguese man pounced on Greatorex early, only losing the table tennis by 2 points, David should have done much better! Jacob then punished Greatorex with badminton and squash victories leaving a realistic target in the tennis which he achieved at 10-8. Not many can beat Simpson at the first 2 sports, I reckon Selwyn Walmsley is the best TT Veteran and Simpson badders, however the strength of Jacobs squash can perhaps only be rivaled by Richard Whitehouse. Simpson was blown away 21-0 and the match was unfortunately heavily balanced now with Portugal. This result duly occurred at 14-6 to Jacob. Seemingly an English victory over Portugal at the English Racketlon Open would have healed some scars from the 2006 FIFA World Cup, Portugal crushing England on penalties and sending Theo Walcott (nappies in hand) back to England. You cannot do anything but admire Jacob coming to Birmingham and crushing a series of pretty impressive O45 racketlon athletes. How charming, how interesting, was that it then? If you think thats it you are in for a shock the best is yet to come! John Weldon and Mat Hickman debutised and won Classes D and C respectively. Both will look to move up and compete again in higher rated events. More Glory For Energetic Dutch Champions! Van der Woerdt showed Natalie Lawrence and then in the final Katy Buchanan some really good all round strength and booked her place in racketlons elite, penetrating the top 10 Ladies World Ranking. In the final Katy got off to a not uncommon victory in table tennis (21-9), her tactic of good serves and forehand topspins serving her in good stead. The final then swung the way of Marielle as she handed out a badminton thrashing 21-2, she is a very good badminton player and it would be interesting to watch her play the likes of Lilian and Kati Kraaving at some point. Katy then won the squash 21-7 to leave her needing 15 points in the tennis. Marielle once again though played a fantastic set and took it 21-3, dominating from start to finish and taking her first tour victory - the first of many no doubt! We can look forward to seeing Marielle inflict more devastation (especially in badminton) on the rest of the world for many years to come! Message : If anyone was unsure about coming to Birmingham their worries were soon laid to rest on Saturday evening when a certain Douglas Struthers met the one they call The Iron Man. Certainly a clash of styles that appealed to the crowd with Magnus a very strong, safe all-rounder against Douglas an Englishman full of adrenalin, pumped up to hit through Magnus wall of defense and power. 21-18 to Magnus at TT, a better result for Doug than Magnus and the key being return of service with both players making too many nervy returns, allowing the other player to attack the 3rd ball of the rally all too easily. A tipsy, curvy battle in truth was the match of the tournament and had it graced a World Championship Final would be talked about for the next 100 years! Sturthers start in TT was good though and amidst around 4 or 5 nets or edges he was fortunate to be so close going into badders. Doug, fought hard, but it was Magnus who took the initiative building a lead and looking good at 16-11. However, it was the English Open winner of 2004 who took the plaudits against the English Open winner of 2002, 2003 & 2006 (or did he?). 21-19 and Doug only one point down going into squash, the tension was building but not even in their wildest dreams could the racketlon audience have predicted what was to occur next. The squash was long and sluggish, Brad Gilberts winning ugly would be relevant here. Neither of these guys wanted to lose and not many risks were taken. Both supremely fit individuals, they were unable to kill off the point. However, this was a rare occasion where Magnus started to look tired (perhaps a testimony to his lack of sleep, rather than his lack of fitness). It finished 21-19 to Doug and therefore one up going into tennis. Suspense is building, normally even if Magnus is 1 down before tennis it is not a problem. However, needless to say it doesnt normally happen against a certain Englishman who considers tennis as his strongest sport! 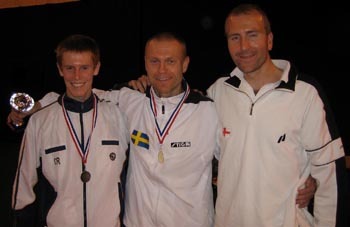 Needless to say the ex-professional ice hockey player was not 100% to take his 3rd English Open title back to Sweden. Doug finished the squash set with a Ricky Gervais type dance pointing and wincing at the crowd, generating applause and uproar never before seen in a racketlon tournament worldwide! It was something special. We can pick up the tennis at 17-9 to Magnus. You suddenly think, oh well, Magnus is just too good. He cant be beaten, not today, not tomorrow, not next week, not next year. Maybe that Finnish bloke can do it, but not the rest. Within a few minutes it was 17-10, 17-11, 17-13, 17-15, 18-15, 18-17  what?!?!? He came back. Neither did the Swede lose his concentration or stop playing well, but Doug was getting to the net and simply just volleying too good. 19-18 to Doug  Wow! 19-19 was like a moment where you see history in the making. Doug was now the favourite and somehow we got to this stage, winner takes all, the final with most probably Calum Reid (who was in the process of brushing aside John ODonnell) was awaiting only one man. So who would it be? Eliasson or Struthers? The answer is neither. Well ok the answer isnt neither, but its just noone knew what was going to happen next. Doug went to 20-19 up, match point. Match point against the World Number One. It doesnt get any bigger than this. King Magno received serve, a good Struthers first serve to his backhand and with an instance Magnus swiped a backhand return hitting it so good, you could forgive the crowd for blinking and wondering what happened. 20-20! Suddenly he had clawed back, suddenly it was 20-20, 21-20 to Magnus, 21-21, 22-21 to Magnus then a Struthers double fault giving a sad end. The line calls were close, but you have to agree that Lawn Tennis Association Referee and Co-Ordinator Om Dass called it straight and that was that. The audience was split 50/50 on the call and it would be Eliasson (the Swede) to meet Reid (the Scot) in a final that would bring the event to a close on Sunday 22nd October. On to the final then, and Reid v Eliasson - the last time they met was at the semi-final stage of the World Championships in Belgium, when Magnus took enough of a lead into the tennis to make the game comfortable after Calum fought very hard at badminton & squash. Unfortunately this time the young Scot just had nothing left in the tank - he began with a 21-18 win in table tennis, and he knows he can do much better, but the World Number 1 played a good game and was very positive. 11 points in the badminton was not enough - he didn't seem to move as well as he usually does and Magnus played an excellent consistent game (as always!) to get on top and stay on top. At 7 points up going into squash things were looking good for Magnus, and this continued as he took an 11-3 lead at the halfway mark. From that point on he didn't look back and finished off the job 21-3 to take his 3rd English Open title, following victories in 2002 & 2003. After some kind words from Eds brother in law Tom Elgood, we held a one minute silence for the late Ed Johnson who tragically died in a motor cycle accident on July 2nd this year. The presentations of prizes, medals and trophies continued with Keith Lesser as master of ceremonies and Mick Strode & Daniel Gillett presenting to the winners. We closed with some short words from Magnus Eliasson who commented that the match with Doug was legendary and the final against Calum (18-21, 21-11, 21-3, -) will be closer next time and he will probably lose. The 2002 English Open to the 2006 English Open, has only been four years the Champion continues however, one thing is for sure and that is the UK have lots happening (maybe more than any other country) and can look to host a World Championship in one or two years. This is certainly a splendid testimony to Tournament Director Keith Lesser, Co-Organiser Ray Jordan, Head Referee Mick Strode and the rest of the other countless volunteers putting the event together. Dominique Ford (trophies), Jon Foulds (photos), Om Dass & Beverley Lancaster (Tennis Referees), Rob Comber, Martin Johnson & Terry Crawford (Next Generation Club West Midlands  Club of the year 2005), Daniel Gillett, Tom Whitehouse (Badminton England), Lloyd Pettiford & of course Stuart Foster. Thanks to everyone and see you next year at Redbridge in August (an acclaimed centre of excellence for badminton, squash & tennis, with 5 courts confirmed for each sport for the 2007 English Open  18th-19th August!). The 1st Birmingham Open at Tipton Sport Academy and the 1st Essex Open Tournaments are likely to take place in January and February. David Lloyd Teeside seem keen to give racketlon a go in March. April could see us back to Birmingham for the British Championships, then back to Hampshire, Eastbourne, Steffan Morgan's King's Club in Wimbledon, The English Open in Redbridge (East London), The Scottish Open (Edinburgh) and who knows what else! The 2007 British Tour is in the making.